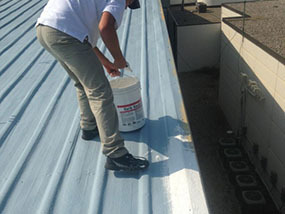 The Roof Coating Company is fully qualified to handle a range of commercial roofing services. Our cost-effective roofing solutions are available to clients in Hampton, VA. To schedule a free onsite roof evaluation, give us a call at (757) 244-2305. We combine top roofing products with a team of highly-skilled roofing technicians. When you hire The Roof Coating Company, you can expect quality craftsmanship and competitive prices. We abide by all local building regulations and federal safety standards. Your roofing system has a major impact on the energy-efficiency of your building. At The Roof Coating Company, we have several roofing solutions that will have your building up to 30% more energy-efficient. Eventually, these services will pay for themselves with what you’ll save in energy costs. Our roof coatings are just one example of an environmentally-friendly solution. Not only does a roof coating reflect sun rays but it also can extend the lifespan of a roof for over a decade longer. This prevents wasting a significant amount of material, time, and money. Roof coatings are affordable and easy to apply. The Roof Coating Company has a team of qualified roofing technicians with years of experience diagnosing and repairing all types of commercial roofs. Our roof inspections are thorough and allow us to patch up all of your roof’s weak points. We offer high-quality repairs at affordable prices. While we always do our best to repair and restore an existing roof, sometimes a roof replacement is unavoidable. This is a large project that should only be trusted with a proven commercial roofing company. With over 60 years of combined experience, we’re prepared to install your new roof flawlessly so that it will last you decades. 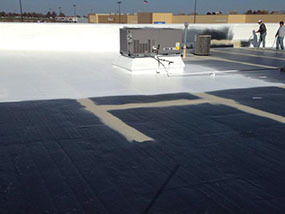 The Roof Coating Company is a premier company providing a variety of commercial roofing services to clients in Hampton, VA. Whether you need your roof repaired, restored, or replaced, we have you covered. Give us a call today at (757) 244-2305 for a free onsite roof evaluation. From there, we can advise you on the best service(s) for your commercial roof.